An aircraft of private Indigo Airlines on a scheduled flight from Goa to New Delhi made an emergency landing this evening in New Delhi after its pilot reported to the Air Traffic Control (ATC) that a passenger was misbehaving and creating trouble on board. The body of a 22-year-old priest bearing bullet injuries was found in his room situated on the premises of a Durga temple in Milk Lachhi village in Greater Noida today morning. Three other religious persons residing with him are absconding. In a path-breaking initiative, K R Punia, national president, Rashtriya Janhit Party (RJP), announced the establishment of a unique ‘knowledge forum’ to forward the region and the country on the road to development through people’s participation here today. 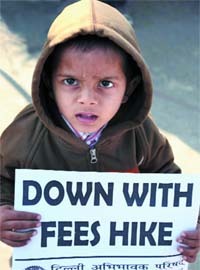 Schoolchildren from different schools today staged protest at Rajghat against the recent fee hike announced by the Delhi government. The Mangol Puri police today arrested a quack practicing in the area. According to the police, Sachindra Nath Mandal (39) was arrested on the basis of a complaint of a Mangol Puri resident who had consulted him recently. The Central Administrative Tribunal (CAT) has upheld the dismissal of a Delhi police lady constable who was caught on camera while taking bribe last year. Heading towards the conclusion of work on Delhi metro’s second phase construction, the final tunnel boring machine started its work yesterday at Dwarka sector 21. Taking the fight against cancer to the street, hundreds of people today walked on Lodi Road to spread awareness against the deadly disease. The walk, organsied by the Indian Cancer Society on the occasion of Cancer Awareness Day, was joined by hundreds of cancer survivors, their families and children suffering from cancer. The Central Board of Secondary Education will open its helplines at 39 centres across Delhi, Noida, Chandigarh, Meerut, Jaipur, Gurgaon, Faridabad, Bhubneshwar, Vishakhapatnam, Jamnagar, Jabalpur, Coimbatore for students from February 1 to April 2, 2009. Indira Gandhi National Open University was recently granted Rs 2 crore to develop an intensive Diploma Programme in Watershed Management (DWM), the first of its kind in the country. A comparatively warm weather continued for the third day in the city today. The residents woke up to a clear sky with slight mist. It’s a treat for art connoisseurs of the Capital as well as entire India courtesy the most-awaited spectacle, the 23rd Surajkund Crafts Mela, which has been flagged off today by the President of India, Pratibha Devisingh Patil at Surajkund in Faridabad. The New Year on the art scene in the National Capital Territory of Delhi began on a mixed note. While there was optimism among the art lovers and artists over the opening of the new wing at the National Gallery of Modern Art as this would provide more opportunity for holding exhibitions. The Joint Committee of Muslim Organizations for Empowerment (JCMOE) today held a national convention on Muslim reservation at India Islamic Cultural Centre. An aircraft of private Indigo Airlines on a scheduled flight from Goa to New Delhi made an emergency landing this evening in New Delhi after its pilot reported to the Air Traffic Control (ATC) that a passenger was misbehaving and creating trouble on board. However, the pilot had given ATC and airport security official a scare when he expressed apprehension that the passenger might be a possible hijacker and demanded priority landing which was granted immediately. Flight operations at the airport were suspended for about 45 minutes before normalcy was restored. Pilots of some aircraft were asked to hover over around Delhi airspace before they got permission to land in view of the emergency landing of the Indigo airplane. “The pilot said he was suspecting a hijacker on board and asked for priority landing. Later, he said that there could be more than one hijacker,” said an airport official. The aircraft (Flt No E-664) was moved to the isolation bay at IGIA Airport after it touched down at 5.15 pm and NSG commandos, CISF personnel and Quick response teams surrounded the aircraft to tackle any unsavory situation. “The plane was parked in the Technical area and all the anti-hijack measures were employed to check whether plane was in a hijack situation. Thankfully, the passenger who threatened to hijack had neither weapon nor intention to do so,”said a Delhi police official. According to him, a person has been detained by the authorities for questioning. Meanwhile, the passengers of the plane were not allowed to disembark for almost two hours. Some of the passengers on the flight even expressed ignorance about any chaos in the plane giving vent to theory that the entire episode could have been a mock drill. Even the preliminary reports had it that the emergency landing could be part of a mock security drill to test the reactions of the response teams. The Airbus A 320 aircraft had about 150 passengers on board. The body of a 22-year-old priest bearing bullet injuries was found in his room situated on the premises of a Durga temple in Milk Lachhi village in Greater Noida today morning. Three other religious persons residing with him are absconding. 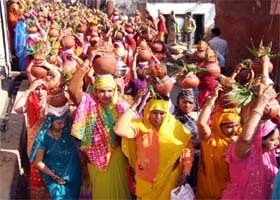 “Pawan Singh, a resident of Aligarh, was performing religious ceremonies at the temple for the last one year. Today morning, when devotees reached the temple they found Pawan lying in a pool of blood in his room. He had bullet wounds on his jaws. His body has been sent for postmortem,” said Rajesh Kumar Singh, deputy superintendent of police. “Pawan used to reside with three other persons. These three were, priest Raj Giri, who has been associated with the temple for the last six years and two other religious persons. But they have been absconding since the incident. It appears that they shot Pawan over some enmity or heated argument in a drunken state. Seven kgs of ganja and seven live cartridges have been recovered from the room, said Singh. We are now trying to trace Pawan’s absconding roommates and are also investigating as to how the arms reached the temple premises. It is a matter of serious concern,” Singh added. The objective of the forum is to provide a platform where common man can present his ideas on how to solve the crucial problems being faced by society. A team of experts will thoroughly examine suggestions to ascertain their practicality and applicability. The solutions chosen from amongst those given by the people will be presented to the masses and the government to ensure that they are speedily implemented. In another significant development, RJP has launched a special ‘Help line’ for the citizens of Delhi, Haryana and Chandigarh that will provide citizens with a credible avenue where their complaints will be heard and assistance is provided for speedy redressal. The Help line will be overseen directly by the senior members of the RJP core team. The help line can be reached via phone or email. The number is 0-94163-68423 and the email id is rjp.helpline@gmail.com. The phone line is open all seven days from 9 am to 9 pm. “All complaints or suggestions received, via phone or email, will be duly recorded and the pertinent actions taken will be informed to the citizen concerned,” Dr Punia said. He had expressed his disappointment with the current rigid bureaucratic structure many times in the past. The system has become so rigid that the common man does not even have ground access to it, let alone solution to his problems. RJP has established the Help line and the knowledge forum as first steps towards a truly sensitive and representative government. The children gathered under Delhi Parents Council (DPC) expressed anguish and resentment against the decision of the government to allow schools to increase fees and forcibly taking money from parents for arrears of teachers. “On the one hand the government is launching campaign like Sarv Shiksha Abhiyan, on the other it is bent upon destroying the future of children by allowing increase in school fees and encroaching on their right to get easy education,” said Praveen Khandelwal, chairman of DPC. The parents at the agitation said that the implementation of Sixth Pay Commission is not justified in schools. “There are many schools where the government has failed to get implemented even the recommendations of Fifth Pay Commission then how can the implementation be successful for Sixth Pay Commission,” Mr Anuj Sharma, one of the protesting parents. The members of DPC said that they will take the matter to union HRD minister Arjun Sungh and Delhi Chief Minister Sheila Dikshit and will apprise them of their position. Mandal stayed at H-734 and practiced at ‘Kakoly Clinic’ here. He was arrested after the police found that he was not registered with the Medical Council of Delhi and did not have sufficient qualification to practice. The police had received complaint from Raj Kumar who said that Mandal gave him an injection after which he not only felt severe pain but also lost sensation in his left arm fingers. After receiving the complaint, inquiries were made from the Delhi Medical Association, which revealed that Mandal was not registered with the Delhi Medical Council and does not hold any qualification to practice allopathy. On the basis of the report of the Delhi Medical Council, a criminal case has been registered against Mandal. He has been charged under the Sections 419 and 337 of the Indian Penal Code and Section 15/3 of the Indian Medical Council Act, 1956, for causing hurt by an act endangering life and personal safety of others. On interrogation, Mandal disclosed that he had been practicing allopathy for the last six years at his clinic. A degree of an ayurved college in Bihar has been recovered from his clinic. The police is now verifying the authenticity of the degree. Rajni (34), who had joined the police force on compassionate grounds in 2002, was sacked after being caught in a sting operation carried out by a news channel in which she was shown accepting money for lodging a report for a missing mobile phone. The Tribunal, after going through the visuals, concluded that there was no inconsistency in the video footage contrary to Rajni’s claim that she was being framed. Rajni in her defense had raised suspicion over the veracity of the CD alleging that the footage had been tampered with using “camera tricks”. While rejecting her plea, the appellate authority said that it was proved “beyond any reasonable doubt” that Rajni accepted bribe and said that there was no reason to have any apprehension about the genuineness of the video. As part of the construction of metro’s much-celebrated venture, Airport Express Link, the tunnel boring machine would finish creating a 1.6-km-long tunnel at Indira Gandhi International Airport by May this year. The authorities at Delhi metro have also said that all the tunnelling work of Delhi metro’s Phase 2 work would be completed by the end of this year. “While this tunnel boring machine will operate on the down line, another machine is already working for the construction of the parallel up line. Two more machines are operational on the Airport Express Link between New Delhi railway station and Shivaji Stadium,” said Anuj Dayal, spokesperson, Delhi metro. For Phase 2 of the Delhi metro, a total of 14 tunnel boring machines are being used. This phase comprises about 30 kilometres of underground section of which about 16 kilometres are being built using the machines. “This is for the first time in any Indian city and perhaps for the first time in any Asian city that so many tunnel boring machines are being used simultaneously for building metro tunnels,” said Dayal. The Airport Express Link has an underground corridor of 15.7 kilometres. The underground stretch starts from New Delhi and continues till Buddha Jayanti Park, where the elevated section starts. The elevated section continues till Mahipalpur and then the remaining stretch till Dwarka Sector 21 is underground. Taking the fight against cancer to the street, hundreds of people today walked on Lodi Road to spread awareness against the deadly disease. The walk, organsied by the Indian Cancer Society on the occasion of Cancer Awareness Day, was joined by hundreds of cancer survivors, their families and children suffering from cancer. Chief Minister Sheila Dikshit flagged off the walk for the third consecutive year. Vice-Admiral Anil Chopra, director general, coast guards and acclaimed cancer specialists of Delhi also joined the walk. “This walk symbolises that nothing is insurmountable when the spirit is right. 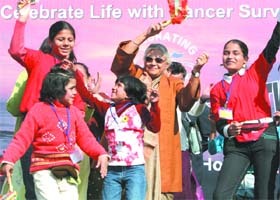 The walk not only spreads awareness about cancer, but also seeks to celebrate the undying spirit of survivors of the disease,” said Sheila Dikshit. Army Research and Referral Hospital, Rajiv Gandhi Cancer Hospital, AIIMS, Artemis, Batra Hospital and Rotary Cancer Hospital had joined hands with the Indian Cancer Society for the Cancer Awareness Walk. Doctors stressed on the fact that if detected at an early stage, cancer can be cured and that there was life even after cancer. The doctors also provided cancer helpline numbers: 2431490 and 9910516562. This year the facility has also been extended to Bhopal, Nagpur, Bangalore, Guwahati, Baroda, Kollam, Kuwait, Dubai, Doha and Sharjah. The tele-counselling helplines has been provided by the CBSE for the last 12 years. A group of 43 principals, trained counselors from CBSE schools, psychologists and social scientists will be available on for tele-counselling on these helplines in the country and abroad to help the Board aspirants fight the exam stress. Tele-counselling for Board aspirants will also be available on Interactive Voice Response System (IVRS) for students in Delhi and Mumbai. Students can dial 1250111102 on MTNL network and 1250102 for BSNL. Indira Gandhi National Open University was recently granted Rs 2 crore to develop an intensive Diploma Programme in Watershed Management (DWM), the first of its kind in the country. The department of land resources, ministry of rural development, sanctioned the fund for carrying out the plan submitted by the IGNOU’s School of Agriculture detailing its developmental schemes of capacity-building for watershed programmes. Keeping in view IGNOU vision of empowering the grassroots with capacity-building knowledge through ODL, the eligibility criterion for admission to the DWM has been decided to be for the secondary school pass-outs or those who have cleared the Bachelor in Participatory Programme (BPP) from IGNOU. The diploma programme will be developed to build up steady inflow of trained personnel in watershed development, management, conservation and other rural extension work in the country. The allocation includes 50% fee reimbursement to 500 learners belonging to rural areas and below poverty line (BPL) for three years. A comparatively warm weather continued for the third day in the city today. The residents woke up to a clear sky with slight mist. The maximum temperature was recorded at 23.3 degree Celsius, a degree above the normal, while the minimum temperature was recorded at 9.2 degree Celsius, which was around the normal temperature for this time of the year. The air and rail traffic also stuck to the schedules. “The visibility was clear at the runways and no flights were either cancelled or rescheduled,” said airport officials. However, the weatherman has warned the residents against the chill, which is expected to make a comeback. “The winters are not over just as yet. We are expecting another cold wave in the coming weeks,” said met official. Meanwhile, the temperature is expected to shuffle between 8 degree Celsius and 23 degree Celsius in the next few days. The 15-day extravaganza, occupying a significant berth in the diverse cultural set-up of our country, has allotted the theme-state pavilion to Madhya Pradesh (MP), which holds the credit of being the best performing Tourism State of 2008. This is the second time after 17 years, the state has got opportunity to interact with the rest of the world at such a comprehensive level. In 1992, Bastar Gate was erected as a memento to MP’s glorious past, but the historical gate now falls under Chattisgarh domain, and so, MP this time came up with a novel thematic idea. Based on the set protocol of holding a commemorative structure, this year’s centre stage pavilion is designed with amazing replica of world heritage site, the Bhimbetka Caves, surrounded by Vindya Mountains. “The thematic set-up has been architectured by world-renowned artist Naresh Kapuria and about 20 per cent of the total number of artisans are expected to be from MP,” informs Ashwani Lohani from the MP tourism department. A family of Bhil community would give a live rendition of the living dynamics of a commoner of the state. Besides the commemorative construction, the focal space is also shared by other symbols of the state heritage, like Sanchi and Khajuraho, which would be kept as the backdrop of the fashion show to be organised by MP on February 7. The theme-state would hold a series of stalls, displaying an array of artifacts and handlooms, including leather products from Indore and Maheshwari and Chanderi fabrics using natural and vegetable dye to present colourful patterns. “This ground would help in keeping alive the traditional art and artisans by encouraging them to continue in this traditional field and ask their children to take up this profession,” said Kishan Rao, in-charge of MP handloom stalls. This platform renders a plethora of opportunities not only to artisans but also to artistes, who would be showcasing as many as 12 folk and tribal dance forms during the course of this festival. With such a wide and splendid range of artifacts at display, MP can very rightly be termed as the heart of the Incredible India. As a whole, this art and cultural exposition, collaboratively staged by the ministry of tourism, handicrafts and handlooms—ministry of textiles and Haryana Tourism, serves as a casement to our nation’s invaluable heritage and ancient cultural treasures, enabling a unique visual delight to tourists from across the world. Meanwhile, this cultural bouquet, offering shades of art and exotic heritage from India, SAARC nations, Thailand and Egypt, secures a visual place in the international calendar. This time, this annual craft fair has been kept low-profiled due to the death of former President R. Venkatraman, and all dance and entertaining programmes have been curtailed till January 2 when the mourning period would be over. The New Year on the art scene in the National Capital Territory of Delhi began on a mixed note. While there was optimism among the art lovers and artists over the opening of the new wing at the National Gallery of Modern Art (NGMA) as this would provide more opportunity for holding exhibitions, there was a certain concern over the discovery of fakes at an exhibition which was supposed to feature works of well-known contemporary artist SH Raza. Of course, the exhibition was immediately called off as soon as the artist discovered that some of the exhibits were not his creation. The entire episode has left a bitter taste in the mouth of artists and art lovers. Artists are unanimous that there needs to be an elaborate system which would help them in protecting their works from the marauding hands of racketeers. With spring in the air, art galleries in the city are now gearing up for the new season, planning and organising exhibitions and shows. Almost all the curators in the city are being kept busy by the gallery owners. The Italian Embassy Cultural Centre in collaboration with the India International Centre here is presenting ‘East Meets West’ on February 5 at the India International Centre Auditorium. In this show, the virtuoso guitarist Giuliano Modarelli explores a new musical dimension through an exciting collaboration with the santoor maestro, Sandip Chatterjee, the renowned mridangam artist, Sri N. Shankar, and the highly accomplished tabla player, Soumen Sarkar, disciple of Pandit Anand Bodas. Originally from Italy, Giuliano Modarelli is an eclectic guitarist unique in his style. During his musical training, he went through many different types of music: from western classical to rock. Giuliano is a guitarist of modern times having studied Jazz at university. He went on to develop through the Indian classical tradition, studying under renowned sitarist Dharambir Singh and Indian classical maestro Buddhadev Dasgupta and Pratyush Bannerjee in the UK. 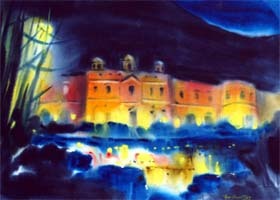 Giuliano is also part of several international projects. He is one of the founder members of the UK world music collective Samay and regularly works with Grammy Award winner tabla star Bickram Ghosh and multi-percussionist Pete Lockett, and many other renowned musicians in India and Europe. Art for Prabhat and Zaza Space are presenting a “Group Show of Affordable Art” by Sudip Roy, Tapan Biswas, Pankaj Mohan Aggarwal, Uttam Basak, Laxman Aelay, Bikash Poddar, G Raman, Birbal Chandrapal and Gouri Biswas. The exhibition which was opened on January 27 will continue till February 14 at Zaza Space, Zamrudpur Community Centre near G.K.- 1. Driven by the conviction that there is a way to create a world of equal opportunities for people with disabilities, the Society for Child Development (SFCD) was set up as a non-profit organization in 1992 to establish programmes and initiatives for its actualization. In the beginning, a school for children with learning difficulties in Shakti Nagar was launched. Prabhat aims to provide students with an educational and training facility that will help them acquire basic living and academic skills. At the age of 18, students transfer to the vocational training centre to learn market-driven skills and crafts. Regularity, precision, innovation and creativity are the keywords at the centre. Specially made works by leading Indian artists using the paper as their canvas are showcased during the Art for Prabhat exhibitions and a part of the proceeds are used to further develop the programmes of the Society. SFCD conducts research and develops accessible reports and publications for wide dissemination. The World Bank, National Commission for Women, and Handicap International have been among the sponsors. The convention was presided over by Justice AM Ahmadi, former justice of India and inaugurated by Saiyid Hamid, chancellor of Jamia Hamdard.